Welcome to Manila! You will be picked up by our friendly representative to take you to your hotel. You'll stay for a night to rest from your international flight before embarking into a great adventure for the next 13 days. It's get up and go time, today you will be travelling to Cebu the first stop of the three main islands for this tour. You will be brought to NAIA International Airport to take the flight to Mactan, Cebu and upon arrival in Mactan international airport; you will then be picked up by our representative for a 3-hour road trip to Moalboal. Check into your hotel and you have the rest of the day to rest. Let’s do some diving! Be amazed to see the sardine run. Morning dives are the best to catch a glimpse of this amazing phenomenon. Depending on the weather conditions, this will determine the additional dive sites to be visited today. Please proceed to the dive shop for a briefing. You may relax and chill by the beach, or do some snorkelling to try and see some gentle sea turtles and the abundant marine life around the reef of Panagsama beach. You will be travelling via a smooth ferry ride about 1.30 – 2 hours to the second island destination, the Island of Bohol. Upon arrival at the port you will be taking a private van ride to take you to Panglao, Bohol. Check in to your hotel and you have the rest of the day to rest or explore the night life along Alona Beach. Let’s do some diving! The weather conditions will determine the dive sites to be visited today. In Balicasag, you will witness an abundance of marine life. A school of jacks is often seen on this dive site, as well as sea turtles. Please proceed to the dive shop for a briefing. You will have the option to dive again, or relax and perhaps get a massage by the beach. Or, you can opt for a tour around the countryside of Bohol. This is a memorable and fun-filled trip to Bohol's tourist attractions such as the world-famous Chocolate Hills. Visit historical and cultural landmarks like the Blood Compact Shrine and Baclayon Church, then go sightseeing at the Chocolate Hills and Man Made Forest. Spend some relaxing time with the enchanting Loboc River Cruise. Also meet the cute tarsiers, the world's smallest primates. This is a rest day in preparation for the flight the following day. You will be taking a flight from Bohol to Coron today with a short layover in Manila. Let’s do some diving! Prepare to see some shipwrecks when you go diving in Coron. The weather conditions will determine the dive sites to be visited today. Please proceed to the dive shop for a briefing. Visit the neighbouring islands of the Malcapuya, Banana and Bulog Dos, which are home to the most beautiful waters and beaches in Coron, Palawan. 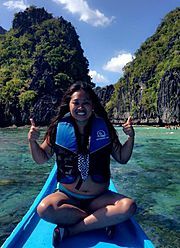 For anyone who has ever dreamed of getting away from the hustle and bustle of the city and finding a tropical hideaway far removed from all the fuss and muss of modern life - Coron Island Escapade day tour is truly an island escape. From your hotel you will be picked up to be transferred to Busuanga Airport for your flight back to Manila. Upon arrival in Manila airport our representative will pick you up to bring you to your hotel. You may roam around the Eastwood Citywalk complex for some last minute “pasalubong” or souvenir shopping. Today marks the end of the trip. Our representative will pick you up from your hotel and drive you all the way to NAIA for your flight back home. Thank you for visiting the Philippines.